MIDDLEBURY, Vt. -- Middlebury's Annie Rowell assisted on the game's first goal and then scored the game-winner just 57 seconds into overtime to lift the Panthers women's soccer team to a 2-1 win over Tufts in the season-opener for both teams on Saturday at Dragone Field. Tufts threatened early with a flurry of shots at the 15-minute mark, but Middlebury keeper Lauryn Torch kept it a scoreless game with a pair of impressive stops. The Panthers took a 1-0 advantage at 17:24 as Paola Cabonargi took a feed from Rowell, with Tufts senior keeper Kate Minnehan (Hopkinton, NH) coming out to cut the angle off. Cabonargi quickly fired and found the back of the net for a 1-0 Middlebury advantage. 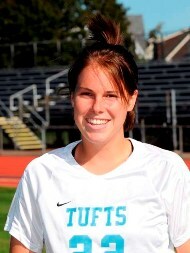 However, Tufts knotted the game in the 30th minute, as junior Sarah Nolet (Los Altos, CA) scored on a beautiful shot from 25 yards out on the left wing after a reset. Both teams saw opportunities to take the lead in the second half, but neither could take advantage of them. The Panthers thought they had gone ahead 2-1 in the 63rd minute as a shot found the back of the net, but the play was ruled off-sides. A well-paced game went to overtime with Tufts holding a 17-15 edge in shots. It didn't take Middlebury long in overtime as they brought the kick-off down into the box. Amy Schlueter fed the ball to Rowell on the right side. She squared to the goal and fired a shot into the far side of the net from 18 yards out to win it. Torch made nine saves in goal to earn the victory for the Panthers, while Minnehan made five stops for Tufts. The Jumbos open their home season on Tuesday afternoon against Keene State at Kraft Field. The action begins at 4:00 pm. The Panthers next welcome Rensselaer on Wednesday at 4:30 pm.